An intellectual tour-de-force delving into the morass of Middle East geo-politics, Syriana launches a thrilling multi-pronged probe of its subject, and emerges with a realistic portrait of a depressing impasse. The film tackles several interlinked sub-stories. Weary CIA Agent Bob Barnes (George Clooney) tangles with arms dealers in Tehran, and in the process loses control of a sophisticated anti-tank missile. 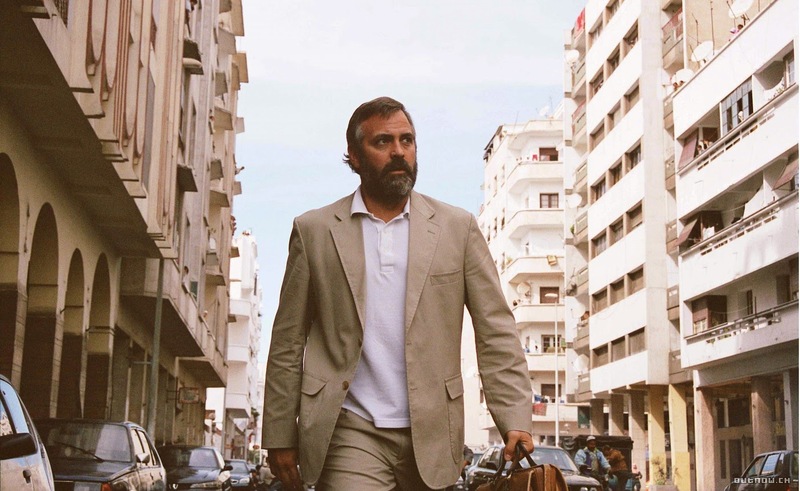 His next assignment is to travel to Beirut and assassinate Prince Nassir (Alexander Siddig), the progressive heir to an oil-rich Arab country. Once in Beirut, Barnes crosses paths with the militant group Hezbollah, particularly the brutal Mussawi (Mark Strong). Big oil companies in the US want Nassir out of the way because he threatens to upset the status quo. Idealistic energy consultant Bryan Woodman (Matt Damon) overcomes the tragic loss of his young son to become Nassir's trusted advisor, and together they plan Nassir's modernization of his country. A large merger of oil companies Connex and Killen is unfolding in the United States. The consolidated company will control vast oil and gas reserves in the Middle East and Asia, and is most interested in stability. Attorney Bennett Holiday (Jeffrey Wright) is hired to investigate the proposed merger, which appears to be a fait accompli. Bennet's boss is political power broker Dean Whiting (Christopher Plummer), working behind the scenes to ensure that the more compliant Prince Meshal (Akbar Kurtha) ascends to the throne instead of Nassir. The merger of Connex and Killen results in mass layoffs in the oil fields of the Middle East. One of the casualties is Pakistani migrant worker Wasim (Mazhar Munir) and once unemployed he drifts under the Islamist influence of charismatic recruiter Muhammad Sheikh Agiza (Amr Waked). Wasim is radicalized and prepared for a terrorist suicide mission, using the anti-tank missile seized in Tehran. Delving into the world of Middle East politics is a daunting task, and Syriana succeeds with aplomb. The fast paced episodic structure preferred by director Stephen Gaghan (adapting the book See No Evil by Robert Baer) is a perfect fit with the fragmented yet labyrinthine relationships that define the region. And other than ignoring the Palestinian/Israeli conflict, Gaghan expertly assembles the pieces of the puzzle and tightly packs the 128 minutes of running time with multiple stories of ever increasing tension. While Syriana's structure works in its favour, it also allows Gaghan to get away with some short-hand. The various stories hold enormous impact thanks to the short sharp jabs style of delivery, but this also leaves plenty that is unsaid and unexplained. The need to fill in the blanks serves the film's intellectual credentials but also gives it a free pass to gloss over what could have been interesting details. There are few happy emotions in Syriana. The film mimics the Middle East's pathetic entrapment into a cycle of pessimism driven by greed and the crushing imperatives of oil, which flows along with espionage, arms trading, corruption, corporotocracy, torture, extremes of wealth and poverty, militant Islam and terrorism. The polluted streams of evil feed off each other and accelerate the downward spiral of violence and subjugation, sucking entire societies into the vortex. Progressive voices are trampled because the system is dependent on maintaining the existing structure among the entrenched power brokers, and change represents an unacceptable risk to the production of oil and profits. The ensemble cast members are all appropriately dour or conniving. Clooney won the Best Supporting Actor Academy Award for his portrayal of Bob Barnes (effectively Baer's character), a disillusioned agent who has seen too many battles and too many betrayals in the back alleys of the Middle East, but knows of no other life. Christopher Plummer is at his oily best as a literal backroom kingmaker. Matt Damon and Akbar Kurtha represent the earnest but naive attitude of optimism that occasionally sprouts in the region, and their characters predictably hurtle towards the impenetrable brick wall of international rules set by others. Also in the cast are Chris Cooper as a Killen executive, Amanda Peet as Bryan Woodman's wife, and William Hurt as one of Barnes' few trusted allies at the CIA. By the time Gaghan wraps up his stories, all his key characters have been profoundly impacted, and of course absolutely no meaningful positive change has been achieved. In the Middle East potential saviours are swallowed by the desert, drowned in oil, and quickly forgotten as the tide of oil-fuelled violence marches on abated.